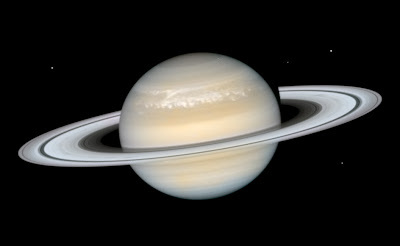 For the past few months, a storm has been raging on Saturn. Over time, the storm has been stretched into the white band seen in the mid northern (upper) latitudes. This view, taken on March 12, 2011, shows the late stages of the storm. It was taken using the Advanced Camera for Surveys (ACS) wide field camera on the Hubble Space Telescope, with color data taken from earlier images of a previous storm by Wide Field Planetary Camera 2 (WFPC2), a camera since replaced by the Wide Field Camera 3 (WFC3).